Buzzfeed raises $50 million: Jonah Peretti is building a viral media empire. That’s $50 million worth of cute. BuzzFeed, the site that gave us “29 Cats Who Failed So Hard They Won” and “The 50 Cutest Things That Ever Happened,” announced on Sunday a new $50 million funding round from venture capital firm Andreessen Horowitz that values it at around $850 million. The series E financing easily eclipses BuzzFeed’s four previous investments, which totaled $46.3 million, and the near-billion-dollar valuation makes each of its 550 employees worth about three times that of a staffer at the New York Times. 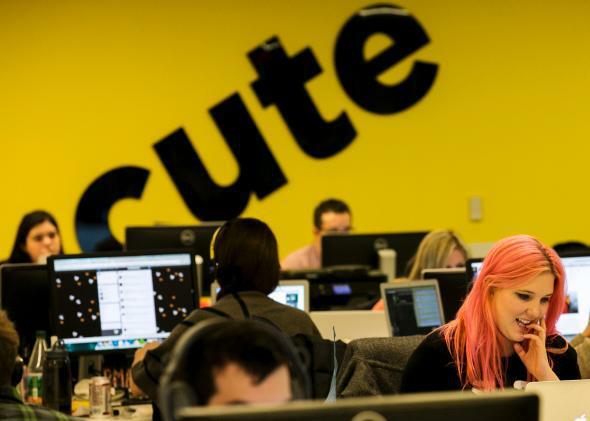 With its new cash infusion, BuzzFeed said it is planning a major expansion. The editorial team will break into three divisions—News, Buzz, and Life—and the video section will expand its work on everything from GIFs to Hollywood-caliber films under the umbrella of BuzzFeed Motion Pictures. A newly created division called BuzzFeed Distributed will focus on creating original content for social platforms like Snapchat, Tumblr, and Instagram. Many of today’s great media companies were built on top of emerging technologies. Examples include Time Inc. which was built on color printing, CBS which was built on radio, and Viacom which was built on cable TV. We’re presently in the midst of a major technological shift in which, increasingly, news and entertainment are being distributed on social networks and consumed on mobile devices. We believe BuzzFeed will emerge from this period as a preeminent media company. That Dixon feels this way is a coup for BuzzFeed, which has walked a fine line between new-media platform and technology-first startup. Vox, the explanatory journalism project of Ezra Klein that trumpeted its modern content management platform, is attempting a similar balancing act. Of course, tech savvy and media chops aren’t mutually exclusive. The trick has been convincing Silicon Valley investors that a smarter digital platform still needs people running it. Proving the added value of those content creators has also hinged on BuzzFeed’s ability to reliably produce viral content. Peretti has spent the better part of his life analyzing what makes something viral. His first brush with viral—before that was even a term people tossed around—was when an email exchange with Nike blew up online and landed him on the Today Show with Katie Couric. After several other one-off successes in that vein, he jumped over to co-found early SEO master the Huffington Post. BuzzFeed was initially conceived of as a small viral lab for running content experiments; now it draws 150 million average monthly viewers. Despite his experience, it’s unclear whether Peretti has cracked the code on viral or if creating that kind of content will always be somewhat like trying to trap lightning in a bottle. But that might explain why BuzzFeed is so eager to expand its offerings and delve into new media formats: While hanging onto viral, it also wants to move beyond it. “Part of the idea of BuzzFeed from the beginning was can we get to the point where the platform is more valuable than the expertise?” Peretti told Salmon. “If you actually have an idea or an insight into how things are shared or why they’re shared or what works, can you build that into either the technology platform or the data science or the culture of a team of people?” With Peretti at the helm, Andreessen Horowitz is betting the answer is yes.